Stylish and modern, Repti-Home vivarium cabinets provide a distinctive piece of furniture and storage space for your vivarium. Re-designed cabinets are sleeker and smarter and the new beech, oak and walnut finishes blend seamlessly with modern home furniture. 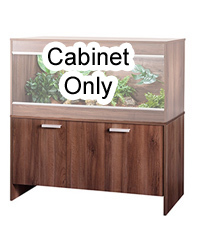 All cabinets are supplied without a top panel to provide a clean, streamlined finish when assembled with the appropriate vivarium. Now fitted with soft close hinges to minimise stress. "Thanks for your quick dispatch, I would recommend your site to friends and will order from you again in the future"